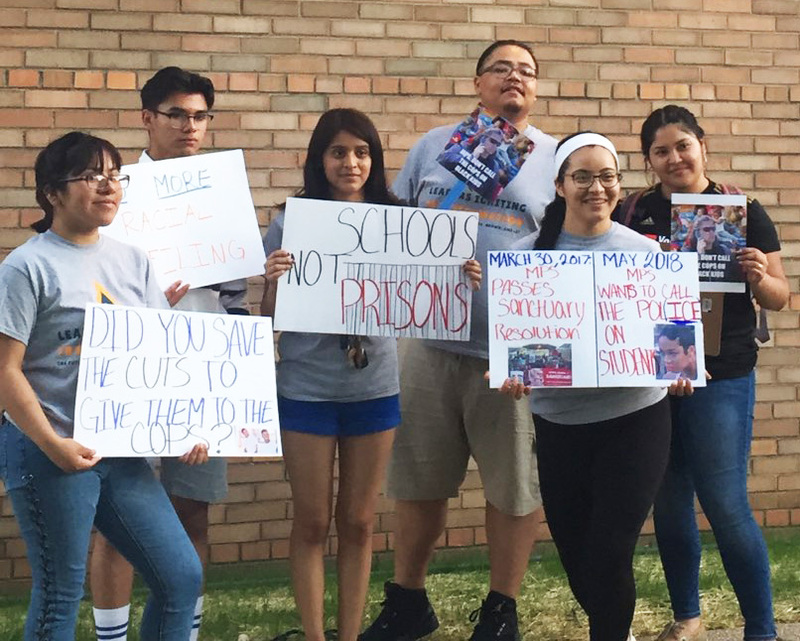 Last week, CPD partner Leaders Igniting Transformation (LIT) defeated a dangerous Milwaukee Public Schools' (MPS) discipline policy that would have further entrenched the school-to-prison pipeline and put undocumented students at severe risk. On Tuesday of last week, young people organized through LIT found out that the Board of School Directors planned to vote on new policies two days later. These policies proposed forcing police into schools for normal youthful behavior. As we have seen, time and time again, in Milwaukee and other places, it is Black and Brown students and students with disabilities, that would bear the brunt of this policy. For example, (even without the policy amendment that was proposed) in the 2015-2016 school year, Black students accounted for more than 80 percent of all students referred to law enforcement in Milwaukee, yet were only 53.3 percent of the student population. Young people quickly mobilized to defeat this draconian plan. In partnership with CPD, LIT responded immediately. Along with other steps, LIT sent a letter to the Board of School Directors and Acting Superintendent drawing their attention to the harmful provisions and the need for genuine youth engagement to develop evidence-based solutions to the school discipline code. Several youth leaders spoke with media outlets before the hearing to share their stories and raise public awareness about the danger this policy would have created. In a surprise move, the Acting Superintendent proposed, and the Board accepted, the removal of the worst part of the policy that would have required even more police involvement in schools. During the meeting, a Board member noted: “this is a good example of democracy at work... this language is something we should have caught before it got to this point, but it was community people that caught this and brought it to our attention.” Those community members were young people with LIT. See coverage of the meeting here. In defeating this proposal, LIT prevented countless young people from being put on the school-to-prison or deportation pipelines. While the revision will have a huge impact on the daily lives of students, it merely prevented MPS’ discipline policies from being worse than they started. In January 2018, the US Department of Education Office for Civil Rights (OCR) concluded a three year investigation of MPS that revealed rampant racial discrimination being fostered through MPS’ school discipline policies. Accordingly, OCR required MPS to revise its discipline policies by June 18, 2018. The policies proposed last week were ostensibly meant to come into compliance with federal civil rights law, but instead went in the wrong direction. Milwaukee still has an opportunity to transform its approach to discipline and end its discriminatory school discipline practices. To create a progressive shift in its approach to school discipline - to one which values and respects the dignity of students - Milwaukee must center the experiences and expertise of young people in developing policies that can instead provide them with support, opportunities and the freedom to thrive. Young people at LIT have developed several solutions in their Youth Power Agenda, which are published in a report co-authored by CPD and LIT. Young people are eager to continue working in partnership with the Acting Superintendent and the Board of School Directors. We only have two weeks until the new policies are due. Young people need your support to make sure MPS lives up to its promise to return revised policies that actually address young people’s concerns. Show your support by signing our petition to tell MPS to follow the Youth Power Agenda!